I have been involved with making, restoring and repairing harpsichords, clavichords, virginals, spinets and early pianos for most of my working life, and the vast majority of my customers for brassware know the funny world we inhabit very well. I realise however that a website will inevitably reach others, so a few words of explanation might be appropriate. Harpsichord family instruments like pianos have large lids although not I hope quite so massive. The lids need to be securely fastened but also must be readily removed: for example when a harpsichord is used with a baroque orchestra the lid open would hide players and the music they make. 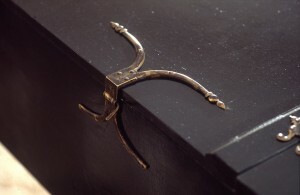 The 'strap' hinges therefore are mostly fitted to the top surface of the lid and fasten to the spine, the pivot being below the lid; the different strap hinges have varying depths for the 'return' and there are fixing holes for the return to the edge of the lid as well as those on the top; these are fitted with a loose pin; some however have no return and are showing on the inside of the lid when it is open. Some of either type are made with a fixed pin and the lid slides off to the tail to remove it. The 'flap' hinges are meant for the joint between main lid and the front 'flap', which exposes the keys and the wrestplank, and are mostly fitted to raised battens on the top surfaces, angled so that the flap opens rather more than parallel to the main lid. Here the important dimension is the open width, since they have to fit onto the battens and not stick out. Locks are either of the 'lock & hasp' variety, or fitted into the top outside edge of the casework, either being very visible and therefore decorative. I'm sure there are many more ways of using any of these decorative hinges than I've thought of…..This is basically a one-man business; I don't pour the metal but I do all else, so any hinge could be given a loose pin if needed; or left with an unpolished but slightly rippled finish from a blast cabinet and glass bead, or even if you have the right object, cast in bronze or even silver (or possibly aluminium although we haven't tried this). The foundry is very small too so we have some flexibility. The castings are not intended to be exact replicas of original fittings. To make accurate copies from originals involves removing them from the instrument and using them to make a mould; this is obviously not acceptable unless there is a specific reason for the brassware to be removed, perhaps for other repair work. In any case, using the original to make a vulcanised production mould destroys the patina. Silicone rubber cold cure moulds are an expensive alternative, and sometimes it has been possible with the permission of the owner of the instrument to take impressions using dental moulding materials, and to use the resultant mould to capture the surface of the item accurately. In other cases, photographs and measured drawings were used to make new masters in brass. The resultant castings are very similar to the originals; they are individually finished and assembled, which invariably leads to minor variations. Fixing holes are normally drilled and countersunk for screws, which are supplied. The brass screws have polished heads. A few items can be supplied with 2 mm pilot holes and brass nails for those who wish to fix them in the traditional way, although this will often cause some delay. 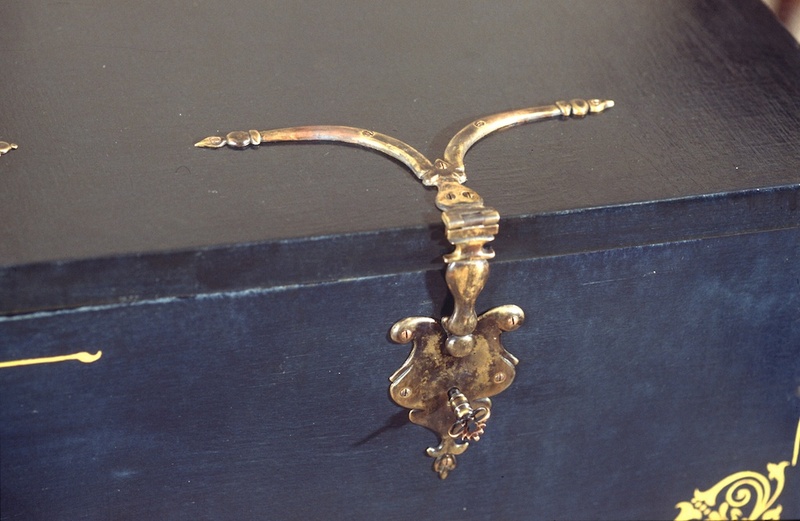 Castings are usually supplied polished, and it is recommended that a light coating of Liberon ‘Jade oil’ is applied after final fitting to inhibit tarnishing. Lacquering is not recommended since lacquered brassware does not age gracefully. The polished castings can be given an antique appearance and then oiled if requested; a 10% surcharge is made for this service. Since many of these items were originally made for use on my own instruments, various extra fittings such as lever escutcheons have been made to complete the sets required at the time; these are included in the catalogue, as well as other useful items that over the years I have repeatedly had to make the hard way. The cast items are made in one very small foundry; this means that inevitably I cannot always hold sufficient stock of castings; recently I have started to make both moulds and waxes in my workshop in order to minimise delays. However, ordering well in advance is really the only thing to do; If I have the things you want in stock, it will still take 2-3 weeks to fulfill an order (except for tuning hammers, the parts for which are usually to hand). Otherwise, allow four weeks minimum. New items can take quite a long time to get into production. The format of the current price list indicates which castings are most likely to be held in stock although I try to keep a few of each casting. Items are assembled and polished only when they are ordered. For the technically inquisitive, the brass used is not the traditional yellow "70/30" brass loved by the antique trade, because it cannot be easily machined (try countersinking it and you will see what I mean). The brass is DCB3 (Die Casting Brass 3) which machines like a dream and visually matches the extruded brass CZ121 which I use for parts I have to fabricate. The pivot pins are mostly Stainless Steel 313, (although occasionally I have used mild steel, in which case it is blued by heating and quenching in oil to resist corrosion). The 'Bronze' is in fact beryllium copper, which could be hardened if I ever needed more strength….it is just softer than your tuning pins but not by much, so the tuning hammer would suffer rather than the pin. The tuning keys wear well, at least I've been using some for ten years now with no problems. It seems now that I have to make the handles of something that CITES hasn't banned the use of; I do have handles of Rio and Honduran Rosewood available, but for export I would have to add the CITES fee and a lot of time, making the export of these to USA prohibitively expensive. Measurements are given of most items, since the pictures are scaled to fit the page, unlike the old paper catalogue where nearly everything was shown full size. The measurements are a guide only; castings are somewhat variable and so am I. Any critical sizes should be taken from the item when you have it to hand.